Thanksgiving is only days away! You have your guest list, the menu prepared, the grocery list ready, and getting your house entertainment ready is the last thing on the agenda. Are you feeling stressed? Have no fear! In today's blog post we are sharing quick and simple Thanksgiving table setting ideas so you can be the hostess with the mostest! Ah, Thanksgiving! One of my favorite holidays. Why is that? Aside from feasting, it's the one holiday that is dedicated to celebrating gratitude and gathering together. In fact, I love Thanksgiving so much, that my good friends and I have started a new tradition called "Friendsgiving". A holiday like this deserves some extra special decoration for our extra special guests. So in today's post I will be sharing with you simple Thanksgiving table setting ideas. 2. Naturalist Glam Thanksgiving Table Setting Idea: Decorating with eucalyptus sprigs, candles and gold silverware. 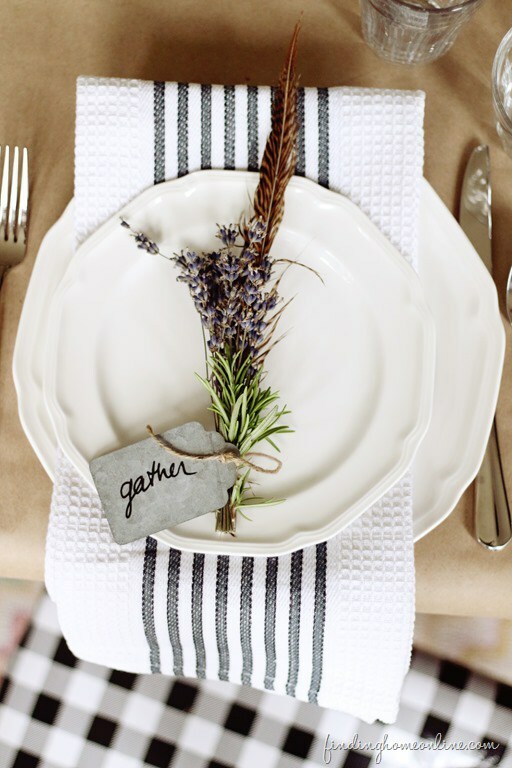 My favorite detail is the fig and rosemary on the black plate with a place card. Natural glam. 3. Earthy Romantic Thanksgiving Table Setting Idea: Romantic greenery garland and candle sticks, skip the placemats and the table runners, let the fresh greenery speak for itself. 4. Minimalist Chic Thanksgiving Table Setting Idea: Dried Flowers and Tucked linen stripe black and white Napkins, and brown craft paper as a table cloth. Casual and chic. 5. Tailored Modern Thanksgiving Table Setting Idea: Decorating with white pumpkins (either real or fake), touches of natural greenery, traditional antique brass candle sticks with a preppy printed tablecloth. A fun mix of old and new for a tailored modern tablescape. And there you have it! Five fabulous thanksgiving table setting ideas for the holiday. I hope one of these ideas has inspired you to decorate. Wishing you and your family a happy Thanksgiving filled with love, laughter, and so much gratitude! Thank you for reading! If you loved this post, let us know! Share with us by commenting below! Are you looking to spruce up your home after the holidays?